Located in Bowmanville Ontario, Wynn’s Property Maintenance has been providing professional landscaping, snow removal and property maintenance services for over 15 years. Wynn’s Property Maintenance is proud to provide residential and commercial property management services throughout Durham and the Greater Toronto Area. Thanks a lot! I love the website and would like my wife and Marcia to connect to do hers as well. 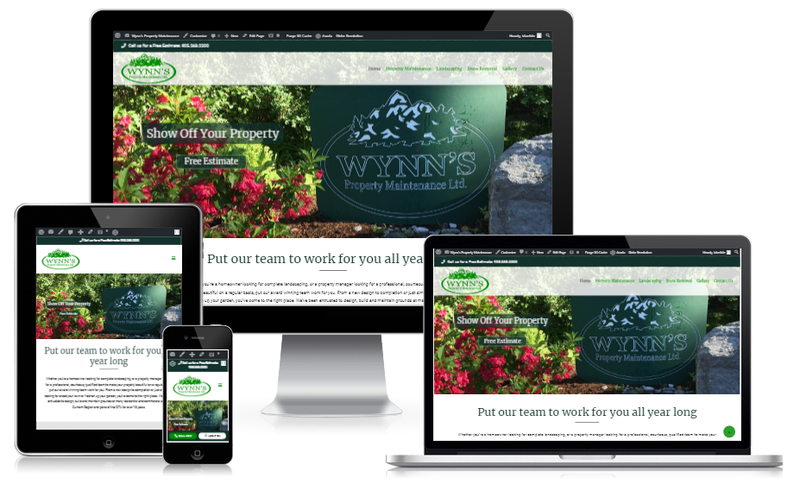 Blue Tide worked with Wynn management to create a WordPress website design that conveyed the earned trust and experience of Wynn’s Property Maintenance. Our design focused on bright fresh colours, clean easy to read services listings and well-placed calls to action. If your landscape company, snow removal company or property maintenance company is considering a new website or website redesign, then please give us a call to discuss website design options today. We can include easy online ordering, local SEO or client login options for property maintenance websites too. Contact us today – Call or text 416-889-7812 or use our contact form.